The fastest formula on the UK ovals, these specialised and highly tuned hatchbacks and coupes are among the most professional setups in UK oval racing. National Hot Rod racing has come a long way since the days of legends such as George Polley and Barry Lee, and now the cars are almost more akin to circuit racing machines than oval racers. Built on specially designed spaceframe chassis, powered by race-tuned 16-valve engines and running on bespoke racing slick tyres, the speeds these cars can achieve in such a confined space has to be seen to be believed. The drivers are the most skilful and talented on the ovals, circulating centimetres apart at full tilt. Many top Hot Rod drivers past and present have become household names in motorsport and many have gone on to greater things in circuit racing and beyond, but the most dedicated National Hot Rod drivers stick with the formula and just keep on winning. 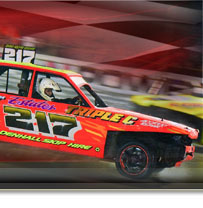 The annual National Championship at Hednesford Hills Raceway is the highlight of the Incarace calendar, but they provide large grids and incredibly close racing at all three of our tracks. 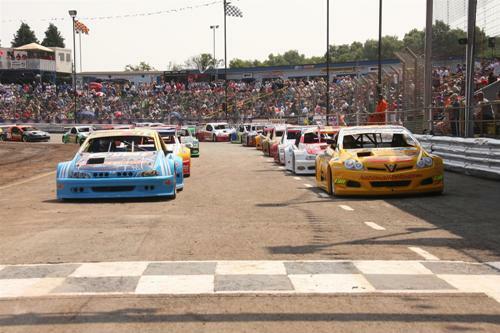 The National Hot Rod World Championship takes place every year at Spedeworth's Foxhall Heath Stadium, Ipswich at the annual Spedeweekend where only the best man can win the gold!! 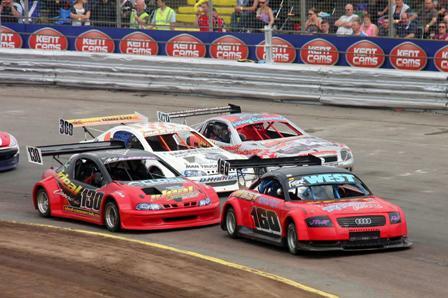 The National Hot Rods race at both Spedeworth & Incarace raceways across the UK.